Here is the breakdown of releases this week. This product is always hot or cold with me. I love the tactile feel of the cardstock, canvas texture, and the smell of it, no joke. At least in previous years. This year they are boosting the chase with a Babe Ruth cut auto. This is a one or two box product for me. I don’t think I will hit the Babe, but I am a sucker for some of the other items like the DK 205 design, check out the sell sheet above and you will see what I mean. This product is ringing in at $68/box which is low. So with little investment, it is worth a shot. If it isn’t for you, because no logos and such, I say move on. There will be a lot of other products and everyone should feel free to collect what THEY LIKE. So I was into wrestling in the 80s and 90s and since then I moved on. Growing up with a Dad that loved boxing, I started watching more boxing and MMA and have stayed with it. That said, it isn’t for me but don’t let me stop you from digging in on this product. It hits the wallet at abut $53/box and promises 2 hits per box, one being a guaranteed auto. I don’t know the WWE Raw roster, but I am sure they got all the stars, to grab a pen and a chair and get to work signing for their fans. Soccer is another one that is not my cup of tea, but this product is an entry into the world of soccer. It is coming in at $112/box or thereabout and promises 2 autos per box. The designs are cool and you can check them out in the sell sheet linked above. This is a hit or miss for me on the Leaf product line, I get the chase and trying to get in our wallets before Panini gets their NFL push going for the “prospects” for the NFL. It is always nice and shiny and the cards are sleeved and top loaded already, it is a solid alternative to the licensed stuff, where you can own an auto of a player without breaking the bank. Get at it and good luck, it is always shiny and I like to see what people hit. In the end, have some fun! There are two different versions of the product this year. Regular ($89) and Jumbo ($168). Regular comes with 5 on-card autos. Jumbo comes with 9 on-card autos plus 1 autographed slabbed 1/1 clear proof card (jumbo exclusive). Panini slipped this one in on their First Off the Line offering but the price point scared me away, also the impending release of National Treasures Basketball. Boxes are coming in at $315/box and promise 2 autos and 2 base cards and I don’t know how they are slipped in but you can hit buybacks some of them slabbed. Looking at the sell sheet, this looks like a high end Classics Football. I don’t think I will be touching this release but if you like it, go for it. I am gonna guess, buying a card you like right off ebay or getting into a break will be the most affordable. That is it for this week, see you again next week! 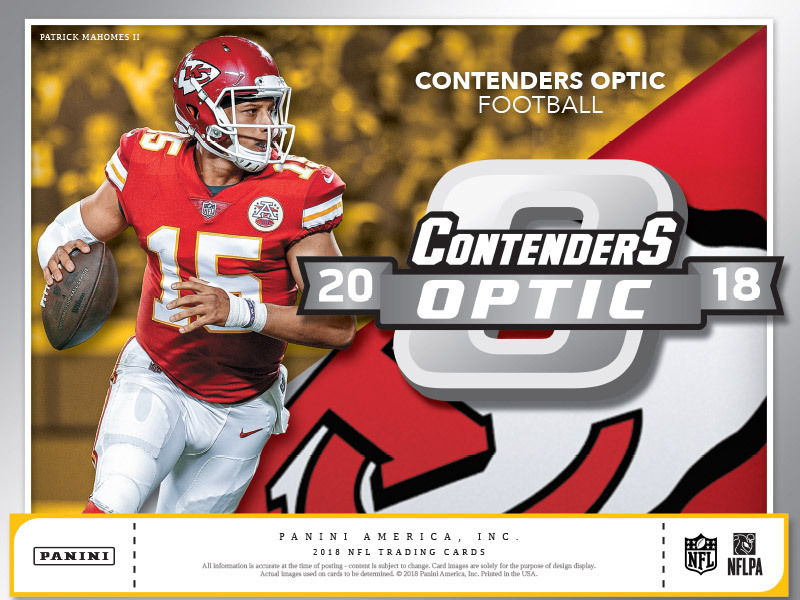 Keeping in line with making base paper product shiny and new with a chrome look, here comes Contenders Optic Football! This set is great looking, I love the thickness of the cards, make me feel like they will hold up for a long time and not bend with age. One thing I hope they do next year is punch up the color of the parallels, they just looked dull in some instances, like the red wasn’t as brilliant as it could be with the Aaron Rodgers parallel. A quick rip that gets right to the point, from a box break perspective, if you are hunting for a big name hit, it was painful to keep digging into a case at the $150/box price point. I got lucky with my box and hit a Rosen Rookie Auto, considered to be one of the top tier QBs. Not sure if that held up and he may be second string come next season, when it is rumored that the Cardinals will draft Kyle Murray. Only time will tell, in the meantime, I will enjoy the cards I hit. Ringing up at just under $100/box is one of my favorite annual products. If you had seen Topps Magic Football, a few years back when Topps still had the NFL License, I was big into this stylized look of the photos, the color pop and the homage to the old school design. This year’s GQ guarantees 2 autographs (always on card with this set). I am not sure if it guarantees a numbered card or parallel, and the big addition of a box topper pack of 3 chrome cards and yes, you can hit a superfractor. My lighting wasnt’ the greatest and what I thought was a shortprint, Matt Davidson, wasn’t. Taking all of that into consideration, the recap at the end of the video was good. I thought the two autos were decent and the shortprints were cool. I don’t know if it is enough to get me to build a set again, price being what it is and the odds, they both are deterrents. I think I will call it good on buying boxes and peruse ebay and see if anything out there catches my eye and I have to have. Side note, I did get into a break and hit a Shohei Ohtani Auto. Can’t wait to get it in. At $65/box or so, get ready, because you are paying for a one-hit wonder here. I love the fat packs but this year, their isn’t one particular player to chase. So if you are looking to flip, this product may not be one you want to dump a lot of cash into. On the other hand, if you are wanting to build a set and get a hit while you are at it, you get four base cards, two base card parallels, normally one numbered and an auto or autograph patch card. Is it worth it? I think on a personal box level, you are taking a bigger risk than normal. If you are sold on this set and want a particular player or card, I would steer you towards buying it outright on ebay. The design is lacking some inspiration with its stylization and coffee stain look. I would think that using the same treatment on the players as GQ will run its course soon with collectors. I am hoping that they up the design game a bit next year… my guess is they won’t. There are case hits with the product, a black card with silver or gold ink auto, then a jumbo patch auto which is vertical. Meh, I could do without this product. More of the same here from the hit Netflix series. I am a fan because I grew up in the 80’s and 90’s and I can remember the clothes, music, and other goings ons that appear in the show and that is just cool. 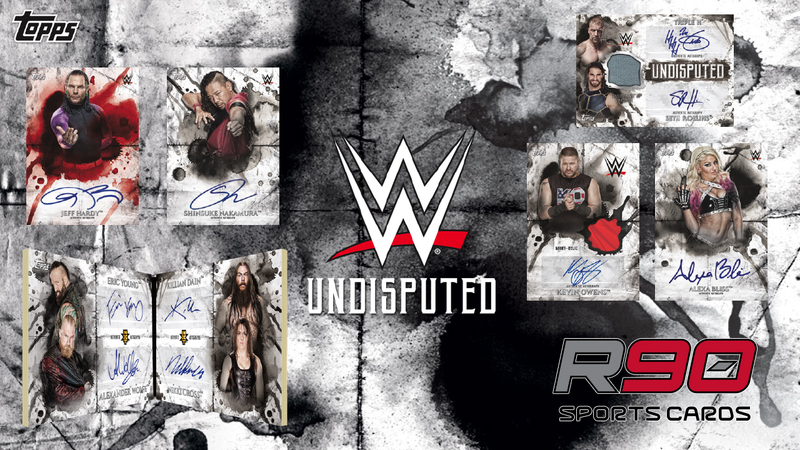 You can expect 2 hits per box with one guaranteed autograph or sketch card per box. David Harbour is on the auto list as are other fan favorites. If you couldn’t get enough the first season, check this release out. 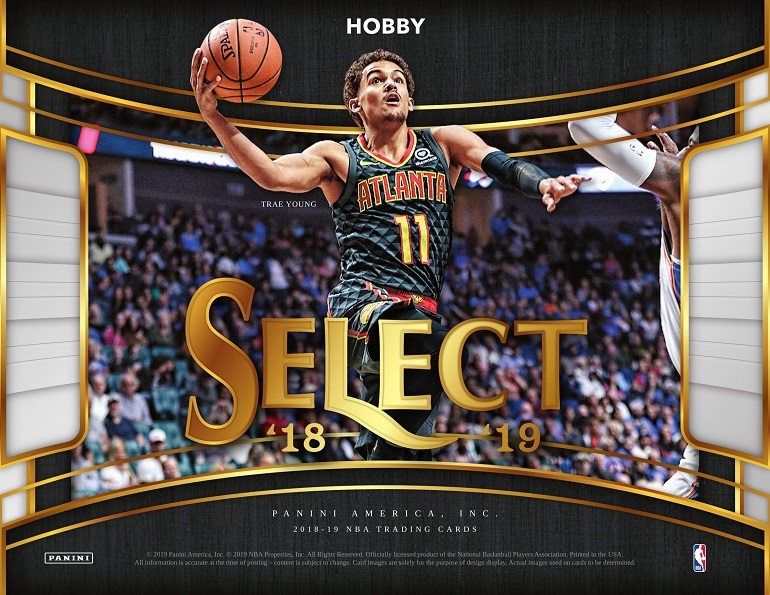 Well the hunt for Luka Doncic autos continues but now you can add Trae Young to the list of hot cards to get after. The design of this product for me has always been a highlight, and I like the canvas texture of the cards. You can expect to see Rookie and Vet autos and surprising use of strong colors with a pop art and mixed media flare. The price point per box is rather low considering all of the product thus far for this season, at $94/box. So check it out and expect 2 Autos, 2 Rookies, 2 Inserts, and One Parallel per box. I gotta be honest, I don’t know what to expect here. I see some big prospect names like Carter Hart on the checklist but I have never purchased or had the opportunity to purchase this product. As with all other Upper Deck product, during the first month, their prices can’t be listed. But, on a per box basis, you can expect 2 Autos per box. My two cents, I will stick with the flagship product from Upper Deck, series one and series two for me. If you have been following @Leaf_Cards on Twitter, you will have seen some of the fantastic cards available in this product including non-hockey subjects, like Babe Ruth, and a cool set of stuff that brings sports names from a decade together. An ultra-highend set this isn’t for the faint of heart and if you can get your hands on this limited product, good luck. I can’t wait to see what everyone hits. I am actually taking some time to visit my local card shop on release to see him open their own personal case of this product. That’s it for this week, get out there and enjoy the hobby. Don’t like the list of new releases? Dig into what you like and see if you can make some trades, make some friends, or make some money on what you have. 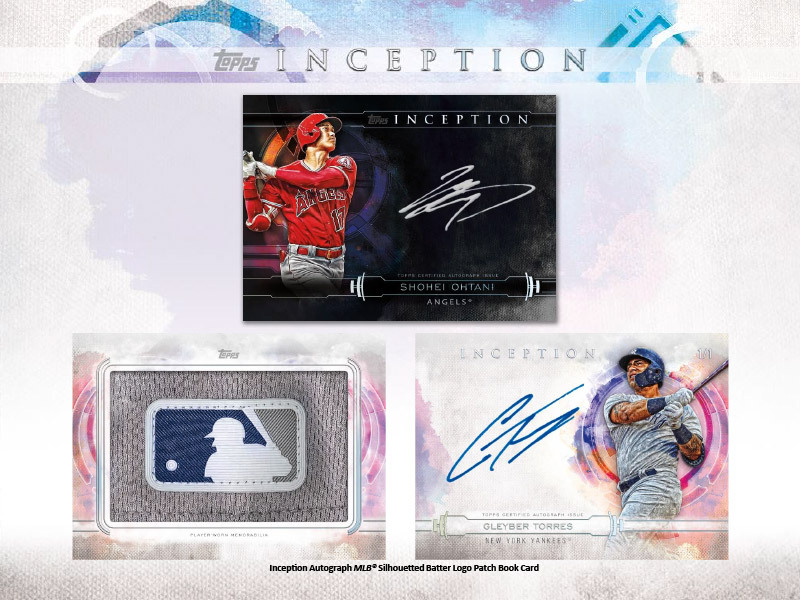 Another year, another Topps Inception Baseball. Coming in with the expected consistency of rookies and vets, get ready for a stylized design to start off the season. Not as big of a secondary market for this set, so if you don’t buy boxes, you might be able to snag cards of your pc players. Wink wink nudge nudge. Yeah, I am suggesting that if you don’t want boxes of this stuff, get out there on the secondary a week or two after release and maybe you can pick up a card of your pc player for less than a box or two. I like the stylized look of this set and always will, but I think this year, I am out and will watch the fun of others hitting! Good luck. Big fan of this product and the “cornerstone” of patches on the cards. I don’t know that it gets much hobby love but I am a fan. 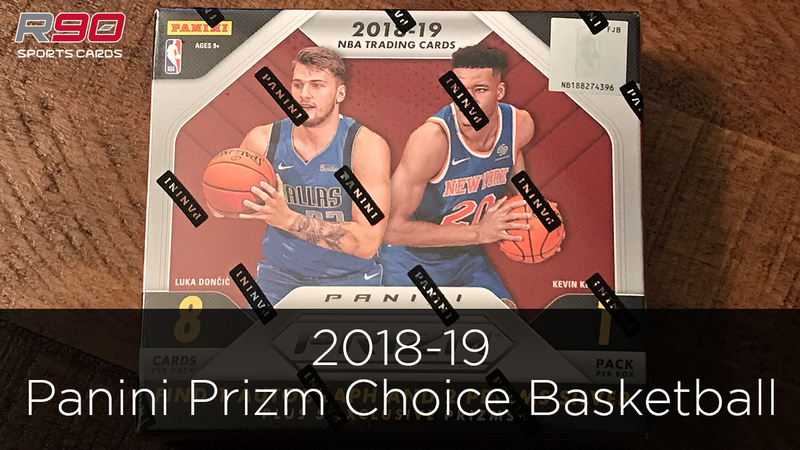 At $140/box, it could be a good option to chase Luka, Trae, or anyone of the other rookies in this class. Since it drops during the season, you just never know when one of them will break out! Take a look at the sell sheet linked above and I think you will like what you will see. Chase them Downtown inserts and show everybody on social media what you hit! I guess if you can get a license and do some football, then have at it. If I reading the right things here, this league is set to become a feeder league for the NFL filled with has beens, hopefuls, and practice squad kinda guys. That said, if these guys are willing to do the work and put in the time, I say let’s give them a shot, enjoy the games and have some fun collecting their cards. 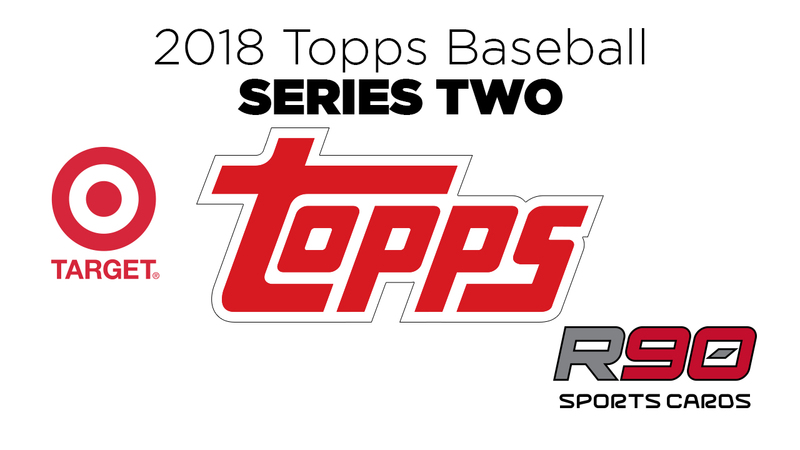 This season is the inaugural set for the league and Topps. 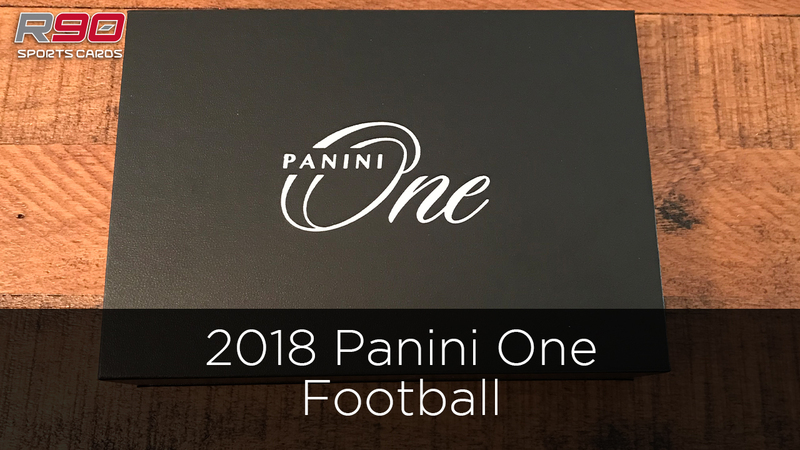 I am guessing that like previous football releases, we will see what we can consider flagship product this go round to see what kind of interest is there, and then it will branch out to other Topps products, like Chrome (this is a forgone conclusion if the set does well), Inception, all the other product variations we had grown accustom to seeing. Hobby boxes will run about $50 – $60. Not sure I wanna take a shot at this at the moment, gonna sit back and see what it looks like and how the hobby embraces it. I don’t know what it is… I know Brian Gray can be abrasive and he plays that role well in the hobby industry, but the products I have purchased this year have been a blast. Why? Well, the price point. Leaf Metal Sports Heroes goes all over the sports world and delivers a similar value with big names like, Gordie Howe, Lance Armstrong, Lionel Messi, Chloe Kim, Larry Bird, etc. Check out the sell sheet linked above. You can dislike Brian Gray all you want, but I like the look of this stuff and it gives a great option at a solid price to pick up autos of some of sports’ biggest names. I am definitely going to get into some breaks of this stuff or get a few personal boxes. If I could get a case, you better believe I would. 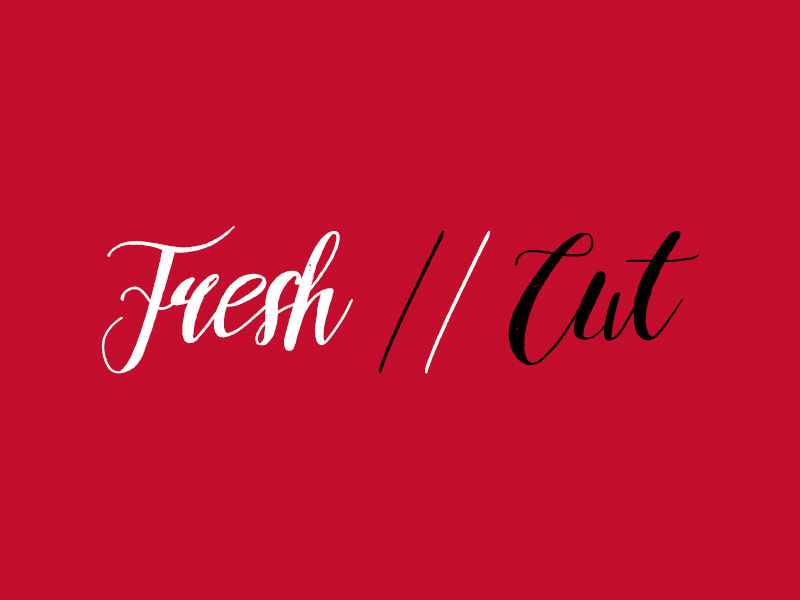 That’s it for this week, stop by again next week for more Fresh // Cut. Leaf has a push to get a lot of prospects out to you ahead of Bowman dropping. I for one like that most if not all of the autos in the Leaf product are on card and although they don’t have logos, they do have some nice eye appeal. Take a look at the sell sheet above and you will see all the big names, Vladimir Guerrero Jr., Wander Franco, Fernando Tatis Jr, and more. Each box comes with 4 autographed cards PLUS one graded slabbed auto BGS 9.5, 10, or the highly sought after BGS BLACK LABEL! I would take a shot at this if you can on release, those slabbed cards could be great. Good luck and I can’t wait to see what people hit. 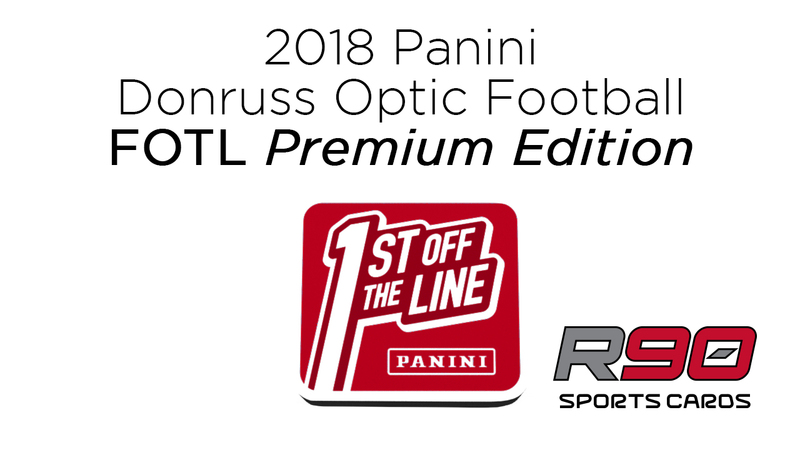 Fan of it or not, First Off the Line is an amazing opportunity for collectors and flippers to get a hold of hot new releases with FOTL exclusive cards/parallels and gets the hobby lit up. I have a blast for the chase of getting a box or more when I have a chance to do it. This set promises one RPA Stars & Stripes #/15 or less. I am looking forward to seeing what this product looks like as it gets busted. I will be looking for breaks to get into and hope to hit something of note. A low end set, this one is targeted to the young fans and introduces them to the hobby of baseball card collecting. This may not be your style but give it a look, you will see it looks like Topps flagship product with some interesting hits (not guaranteed). An annual anticipated hockey release, here is another chance to get you Elias Petterson, Brady Tkachuk, Carter Hart, and more! You check out the link to the sell sheet above? The designs are always cool and the cards look sweet. I love the hockey patches as usual and the autos although cool, are hard to see at times with the silver ink on such busy designs. That said, for the hockey fan, this is a fun box of cards. This product is always a blast to rip because the silhouettes can be sweet with the USA patches. 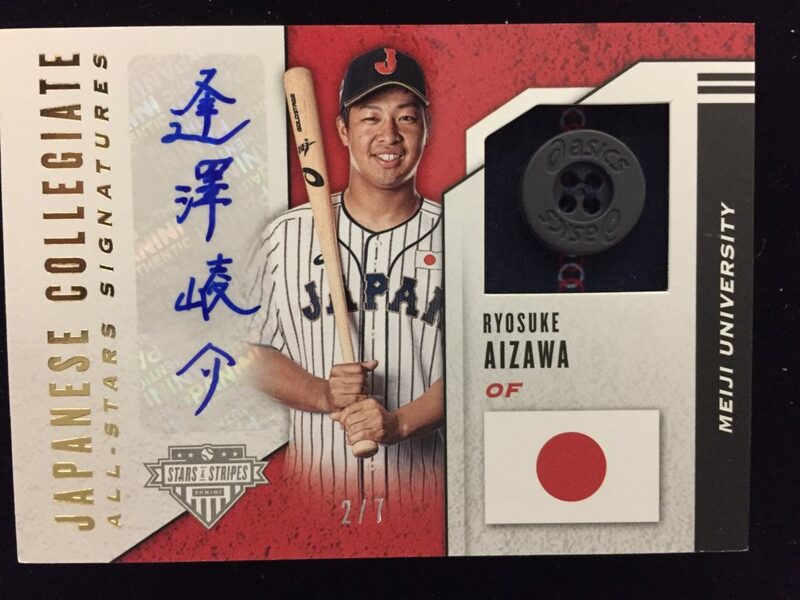 I did a box of this and got a button card of a Japanese Collegiate All Star, Ryosuke Aizawa. I am looking at stats on the kid now because of the card. You can expect players from 15U on up so you will get autos and relics from kids way early on in their baseball careers. Creepy maybe, that you have a kids card in your hand, but hold that card and they may just become the next kid called up to the big show. Coming in at a relatively low entry cost, this product delivers hits in each pack so looking for some fun with some future booms (thanks for this saying Tony! ), this could be the product for you. This was the year that Jaxson and I were going to go to the National in style. I had plans for us to fly out, then because I had no obligations, we would pop in and out of the National and just do what we wanted, the hit the town and make Chicago our playground. I had the tickets purchased, the hotel reservation, and working on a list of places to visit, eat, and other events to attend in the city. So he has plans for a school group that he can’t miss as an incoming Freshman… BTW, he is going to be a Freshman in high school… kid grew up too fast. I will be attending solo as I mentioned in the tweet. I do have a lot of friends that will be attending so of course, I am looking forward to seeing everyone and hope to hang out more with everyone since I won’t be doing any work and will solely be there because I want to be. 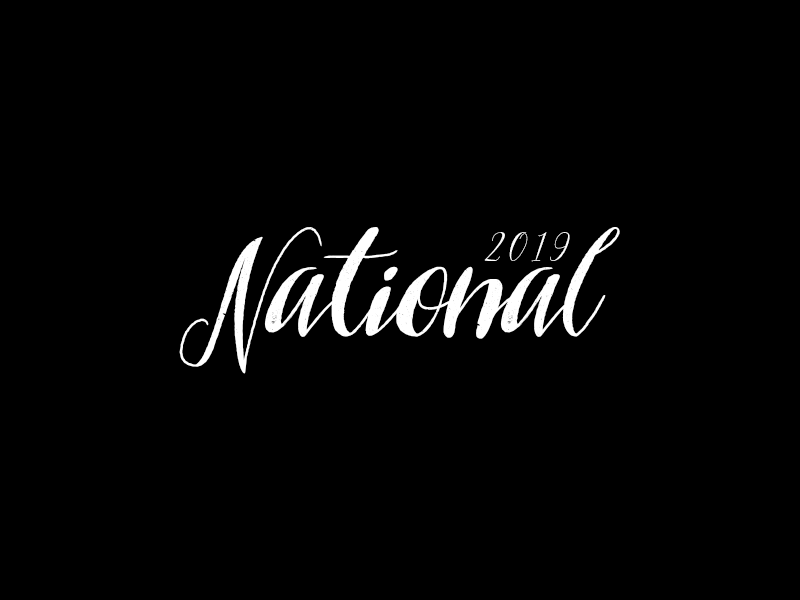 If you are reading this and are attending the National I hope to see you there. With the 2019 Rookie Class shaping up to be the deepest in recent memory, there will be plenty of sought-after Rated Rookies with a talent level to match their demand. I am digging some of the inserts, like the Retro 1985, and Dominators. Will I be digging into it, maybe a box. I will definitely be waiting for the Optic version and man I hope my wallet can take it. I got three of the First Off the Line (Product Review) flavor of this and it was Select, always impressive with the shiny finish, confused by the three tiers, but overall, love the color parallels as much as the next guy. Collect the top rookies from the 2018 NBA Draft Class! Tie-Dye (#’d/25), Gold (#’d/10), and Black (one-of-one). Tie-Dye, Gold, and Black all feature prime swatches of jersey! If you are a big fan of this rookie class with or without Luka Doncic, get in now and take your shot here and I hope you hit big or at the very least, you enjoy the rip. This set is intriguing to me with the slabbed graded cards. How much are we paying for the grading service as the consumer? Is this impacting the turnaround on grading of consumer cards? two memorabilia cards per box on average. Then after wondering all this I think… I am not the target audience for this one. I do enjoy watching the breaks and watching the grades coming out of this stuff, hoping to see that rare black label 10/10. I hope that they all come with subgrades, but I am sure they won’t. Even though it isn’t for me, I hope that if you take a shot at it in a break or personal box, you get that big rookie from this years’ rookie crop, Baker Mayfield, Saquon Barkley, and others of course. CHINESE NEW YEAR PARALLELS: Base, Emerald #/88, Holo Gold #/8. I got a smokin’ deal on this 8 box case, so I couldn’t say no. I got home with the case and jumped into the review video as soon as I could. The breakdown of the packs were two base, one Chinese New Year parallel, then two base. 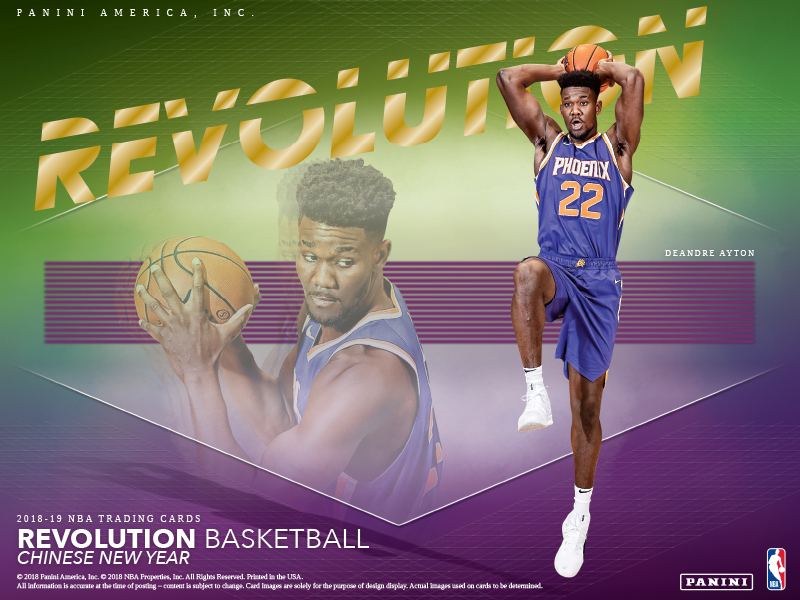 I started to notice trends of certain player cards coming together like Donovan Mitchell and James Hardin, you will see the pairings when you watch the video above. I would caution you to make sure if you get in an 8 box case break of this stuff, and they don’t ship everything, you are highly likely not to get any cards. 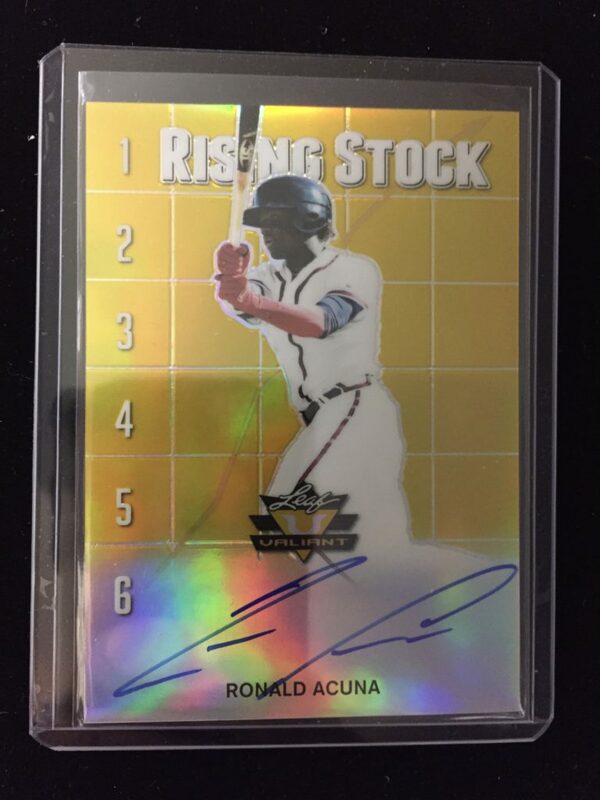 We didn’t hit any big autos, not guaranteed in any of the Revolution product, which is all about parallels, but this stuff is really just limited to the Chinese New Year parallels, the Emerald /88, and the Holo Gold /8. Of course if you do hit an auto it is numbered to the players’ jersey number so those are the HUGE chase in this stuff. Good luck to you if you decide to open it and at the price point I got the case for, I may just have to dig in again. Thanks for stopping by and let me know your thoughts by commenting below. This basketball season from the hobby side has been riding on Luka Doncic of the Dallas Mavericks and I am buying into the hype. If you watch the break, I was using a different machine and it felt a bit awkward, I was also on a google hangout and reading text messages… ha. The distractions were real, but I got the box ripped and hit that Neon Orange Pulsar Lonnie Walker /13. A sick card but that was about it for the BOOM from the product for me. Off camera, I opened the two other boxes I snagged and they were, okay. Select is always goofy to me with the three different levels of cards/designs, but I always get drawn in by the shine. I can’t lie, I don’t need another shiny product and of the three, this is number two for me for Panini product. Optic and Select are great opens for me, even though I know Prizm is where the value can be found with the Silvers. 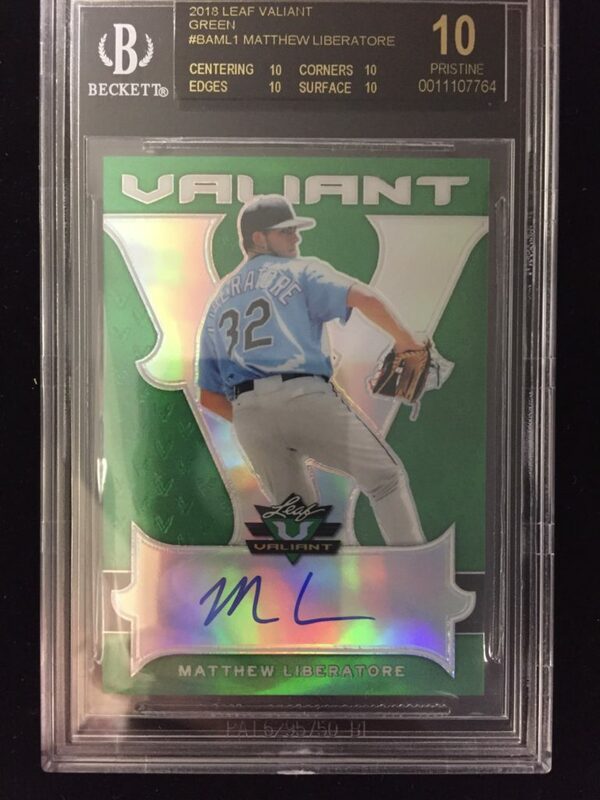 I did send the Liberatore auto in for a replacement the day after this review. I now have the replacement in hand on February 22nd and it is clean! Thanks Topps. Unscuffed replacement that came back pretty fast! Brand new to the hobby from Panini America but it follows the format of Topps Dynasty and Upper Deck Splendor. As stated on the sellsheet, 85% of the product will be patch autos. This is sure to be full of top tier rookies and lots of vets to go around. I love the look of the cards and that they didn’t use image variations which is something I didn’t like much at all about Topps Dynasty. Good job to Panini and I think the hobby is loving this stuff. I am one of those in love with it and look forward to its sophomore release and of course, I am waiting to see what they do with this in Basketball and Baseball. Should be great! Thanks for watching and let me know your thoughts by commenting below. 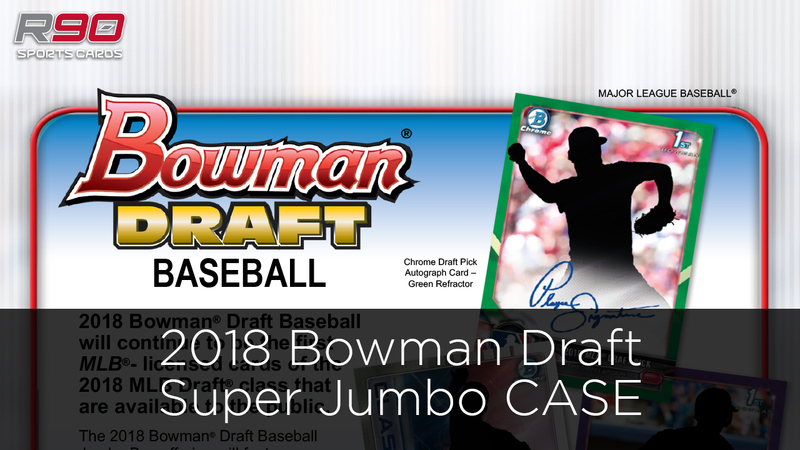 Bowman is THE product when it comes to chasing prospects and the big chase is always the superfractor autos of the 1st Bowman cards. I was able to get my hands on a super jumbo case. It wasn’t cheap but was one of the things on my hobby bucket list to do. Purchase a case and rip it for me! Apologies for the music being louder than my voice in the video. It is a long one so if you want to skip to the end about the 1:01:13 mark, you will catch the recap with all the autos. I love the product and the chance to get my hands on some of the up and coming players that I will monitor after I get their cards on MLB.com. I like to watch how their value will rise and fall and where they are on the Top 100 prospect list. 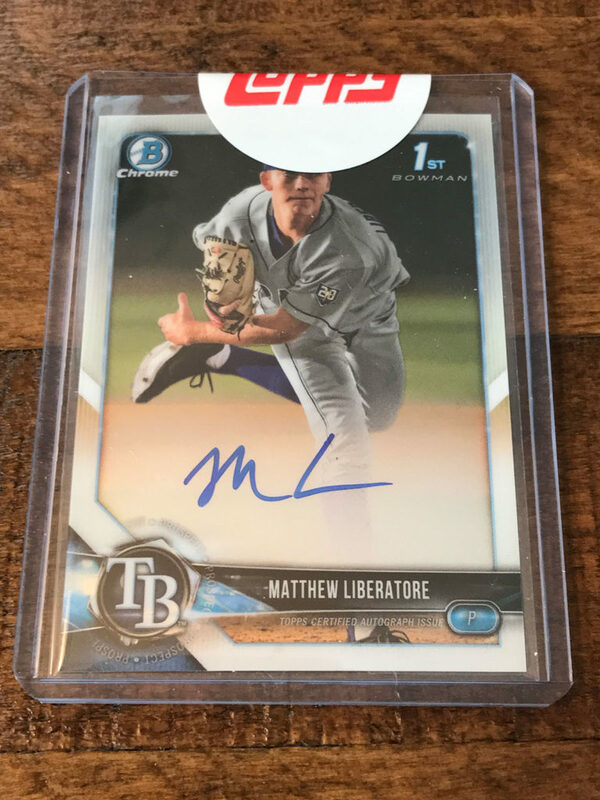 There were some surface issues especially on the base Liberatore auto, so I plan to send that off to customer service and see what if anything can be done. If something happens, I will do my best to add an UPDATE to this post. Now to sort the stack of base chrome and figure out what to do with all this paper base. I think I my local card shop might get some new singles for their shelves. Oh if you are curious, I took all of the autos and checked all of the recent sales numbers. If I were to move them I could expect about $935, which by current box prices, is enough for a half case. One of the hobby world’s sought after product for football, this set is cool and the design this year is a hit for me. I like the large team logos on the bottom right of the base cards and I do enjoy the ability to scope out and find the variation autos just by looking at the front of the card. Kudos to the design staff at Panini for taking a stab at making it easier. In the video above, you will see me finally notice the difference, now I just need to confirm it, lol. If you are an NFL fan and in the hobby, I would urge you to take your shot at a box and GOOD LUCK, sometimes, you may get a “who?” result, to find out later, the player is ridiculously good, of course it could be the other way around, but let’s stay optimistic! Got my hands on some Asia exclusive product. It was a fun rip. I liked the parallels and the quick rip. No base to worry about really after the fact. I hope they release this in the U.S. next season. I bet it will be a big hit with everyone depending on the buy-in. By the way, the Tiger stripe? New favorite parallel. I was lucky enough to land a box of this stuff before it sold out. If you haven’t watched the video, here is a quick summary. It is a “premium edition” boiled down to 6 cards per pack, 1 pack per box. 2 Autographs on average, so you get to the nitty gritty fast. Essentially, you are buying two hits. The cards are what you expect from Panini’s chrome product, thicker cards with that awesome shine to the parallels. I landed a Purple Star Auto Parallel as promised. The parallel looks cool and the stars are pretty subtle but eye catching. I also landed what I believe to be a red parallel, which as usual, is a striking color to see. I was happy to see that the autos I did pull were both on card. I got a Topps Home Run Challenge card in a hobby box of Allen & Ginter this year. It was Nelson Cruz of the Seattle Mariners. So the way these work, you log onto your account (if you don’t have one, make one) on Topps.com. Then go to Promotions and then click on the Home Run Challenge Icon, not the Home Run Challenge Rules, like I did the first time I got to the site. 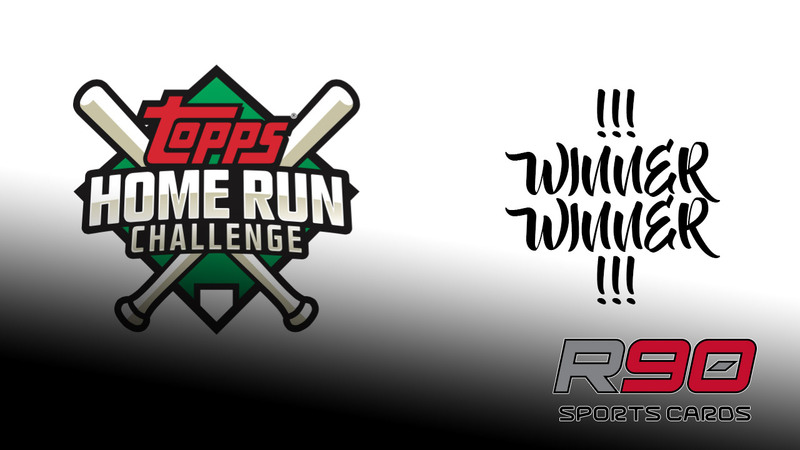 From this page, click on the CLICK HERE TO ENTER CODE button, enter your code on the back of your Home Run Challenge card and then you can pick the game that your player will hit a homerun. If your player hits a home run, you will get a parallel card of said player. You can check out the rules here. If I am not mistaken, the promotion has ended. Along with the parallel card, you also have a chance to win a Monthly Grand Prize which is awarded to a random winner for the month. Pretty cool stuff, good luck to all the participants! When I saw the two boxes of Undisputed arrive at Scott’s I had to ask if he was open to me busting them and doing a product review. As you can see in the video above, I thought I would take a different route to the video, rather than show the pack opening, I just showed the results. I am not sure if this is a method I prefer, but it sped up the process and you could see the amount of cards you can get and the hits faster than if I had opened each pack. Let me know in the comments below if you like this better, or if you prefer to see each pack opened. I really like the thickness of each card, each comfortably fitting in a 100pt top loader. The hit per pack style was awesome as was the guarantee of 8 autographs per box. It was good odds you would get a group of good names or a good chance at parallels in your box. I like the design of the cards with the ink blot that made the card feel dynamic and rough which is what you want a wrestling card to look like. I also like the varnish on the photos on a matte card. The back of the card had short snippets of info about the wrestler and a key match in their career. The subsets celebrating 30 years… man 30 years. Survivor Series and Royal Rumble. They were a walk down memory lane. It was really fun reading about the event after the video stopped and I put the cards back in my shoebox. If you are interested in any of the hits, please check out my ebay listings. I had no idea what to price these at so based on checking out listings prior to posting my hits, I had some general figures to work with, they will be adjusted as cards complete sales. 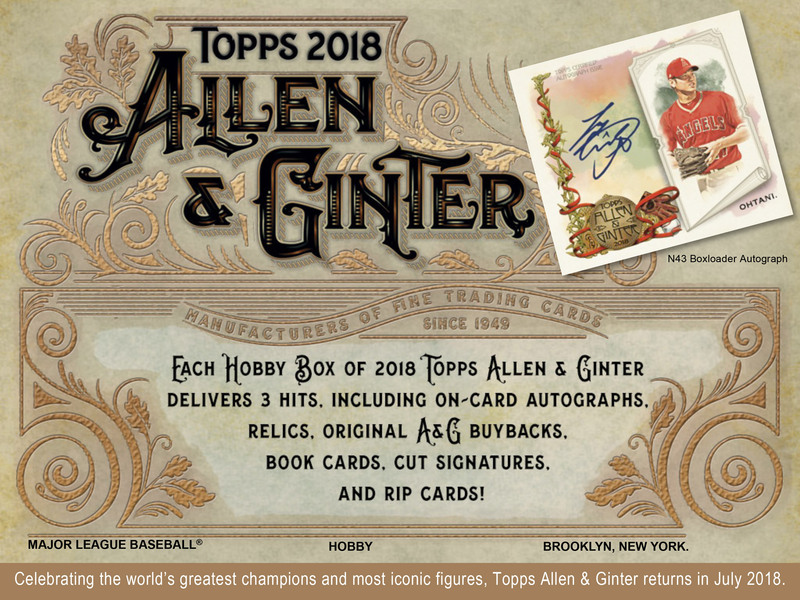 I got sucked in by the quirky and odd with Topps Allen & Ginter again. Not to shabby though, I got three relics, including a framed mini relic of Kris Bryant. I also was lucky enough to get the one per case box of silver gloss cards. I will have to look at the backs of all of them and make sure non of them are 1/1s, as they do exist. I actually saw one in a personal box break that All Star Sports Cards did. I didn’t expect anything new here, but I am disappointed that I thought all this time there was the A&G codebreaker promo, to find out they haven’t done it in a few years… bummer. Anyways, enjoy the video and should you do a box or two or more, I hope you hit one of the fun rip cards or a book or any other crazy hit available in the product. Also, I mention it in the video and would like your opinion. Do you like the “Fake” relics of mythological creatures and stuff like that? Comment below and see you next time! I was able to get a blaster of this at Target and went in hunting for a short print of Torres or Acuna, came away with a Derek Jeter Legend SP. I can’t complain for the flagship product. Again, I always hate the cardstock for this stuff, too flimsy, but it is what it is. The flagship base product has been including some great photography, I liked the team photos or at least the more candid photos of some of the stars of the game. If you can get a hold of a blaster or more in retail, it is a cheaper way to get your hands on the stuff, always a fun rip in hobby or retail. Enjoy it, then get out and see a game live and in person. © 2019 R90 Sports Cards. All Rights Reserved.